What would be your answer if I ask you how important is a menu for your restaurant? Or let's say does menu only limits up to display the food items you have in your restaurant? No, you are wrong! Your restaurant menu has a lot more to do with your restaurant. Your menu is the first thing which will impact your customers and it certainly holds the brand name of your food business. More attractive and convenient will be the menu, more will be your customers. 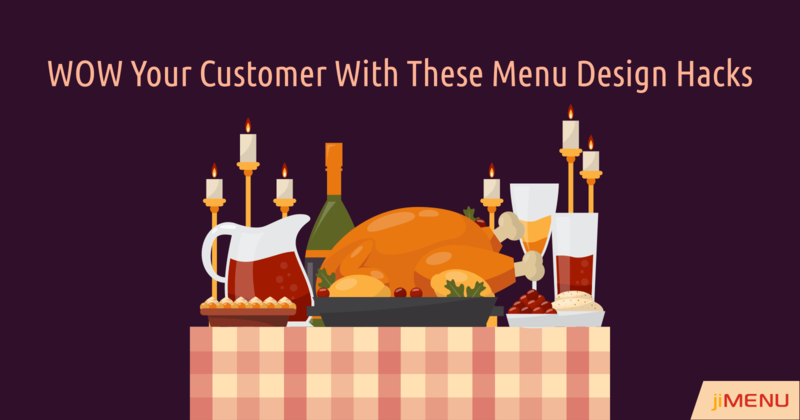 Is it the time to analyze your menu design? As your menu is going to represent your restaurant's brand name, it becomes necessary that you keep your menu updated all the times, with respect to food items or design, both. And it's quite obvious that the menu you got designed two years ago will not be fit to meet today's customer needs. Isn't it? So, you need to analyze that is your menu design up to date and is attractive enough to convince your customers or not. Otherwise, you must adopt some menu design tips and get your restaurant menu updated right now! Analyze your Customer’s Psychology: Before you begin your menu design, identify who your customers are. Their geographical locations, their likings, how often do they order, their age group, and other necessary things. Once you get a clear idea about it, you can easily get forward to design a proper menu for your restaurant. Mention the Ingredients: As the customers are becoming more health-conscious, they want to know every single ingredient in the food they are eating. Try to add menu labeling to your menu which describes the quick ingredients about the food item and helps in delivering more information the customers. This helps in building trust amongst the customers as they get aware about what they are eating. Read more about menu labeling. Separate the Food and Drink Menu: Remember, getting an impressive design for your menu is not the end of the game. You need to categorize the food items properly because if you jumble up the menu items, it would complicate it for the customers to place an order with you. So, you need to spend enough time while planning the menu items, make sure that you keep the foods and drinks separately to make it easy for the customer to make orders. Don’t Line It Up: If you are simply lining up all the food items on the menu, you are on the wrong side. Nobody loves boring and lengthy menus, try to add some images of your food items which will present a refreshing view of your menu and even the images are helpful in convincing the customers to order more from your restaurant. Keep the Menu Updated: Its irritating for the customers when they spend time on deciding their order and get to hear that this item isn't available. You need to keep a regular check on the availability of food items, remove the seasonal items once that season is over, and keep your menu updated at all times. This is where digital menu shows its best advantage as it allows you to make instant changes to your menu without any efforts. Get your digital menu from jiMenu! Want to build an impressive and impactful digital menu for your restaurant? jiMenu is one such advanced platform which takes your menu over the digital tablet. Enhance your customer's dining experience at the most affordable prices with jiMenu. Still not convinced? Get in touch with us and know the exciting features of jiMenu.